This pattern is my "everyday" pattern. This is the one pattern that I trade the most often because of its reliability. It is easy to spot on a stock chart and simple to trade. The name T-30 refers to a "tail" that slices down through the "30" period exponential moving average. This looks like a hammer candlestick pattern on the chart but it doesn't have to be a perfect hammer to be considered a T-30. Also, the color of the real body is not important. This tail on the chart flushes other traders out of the stock. Note: There is nothing special about the 30 period moving average. It is just a reference. Look to the left on the chart to determine support and resistance. When you are trading any kind of tail or hammer pattern, always look for volume to be higher than the previous day. This suggests that many traders were shaken out and demand is picking up. This is important! There a multiple ways to trade this setup depending on your desired risk/reward. I'll tell you how I trade it and give you an alternative that you may want to consider. If you are able to trade during the day then buy the stock on the day of the hammer (tail) near the end of the day. You not need any kind of "confirmation" or anything else. You only need to see that this stock is at a support level and that demand is coming into the stock (volume). That is all the confirmation that you need. If you cannot trade during the day, then place your buy stop above the high of this hammer day. The next day you will have to check to see if you get filled and then place your stop loss order. You could also use a bracket order. There are two options for the placement of your stop loss order. Each has advantages and disadvantages. You decide what is right for you. Put your stop under the low of the hammer. The advantage to this is that your stop is far away from your entry price and you will not likely get stopped out prematurely. The disadvantage to this is that because your stop is so far away, you will have to buy fewer shares in order to comply with your money management rules. Move down to the 60 minute chart and put your stop under a support area closer near the real body of the candle. The advantage to this is that you get to buy more shares because your stop is closer to your buy price. The disadvantage to this is that because your stop is so close, you may get stopped out more often, before a big move happens. Personally, I prefer option 1. I have no problem buying fewer shares in order to have a successful trade. I like that fact that my stop is far away from the "market noise". Then I can sit back and wait patiently for the stock to move in my favor. When you are trading wide range days like hammers, you will find out that many times, the stock will trade sideways for a day or two. That is fine. You are already in the stock just waiting for other traders to enter. Also, the days that follow a hammer are typically low volatility, narrow range days like stars or doji's. Be patient! Do not get anxious to move your stop up. Wait for the stock to actually move in your favor before you begin trailing your stop. Once the stock moves in your favor, then you safely begin to trail your stop using your favorite exit strategy to lock in profits. Focus on those stocks where the real body of the candle is close to the 30 EMA. You want as many traders as possible shaken out of this stock before you get in. This setup is reversed for short positions except now you are looking for stocks with a shooting star pattern through a declining 30 EMA. Give more weight to setups with multiple tails over several days. 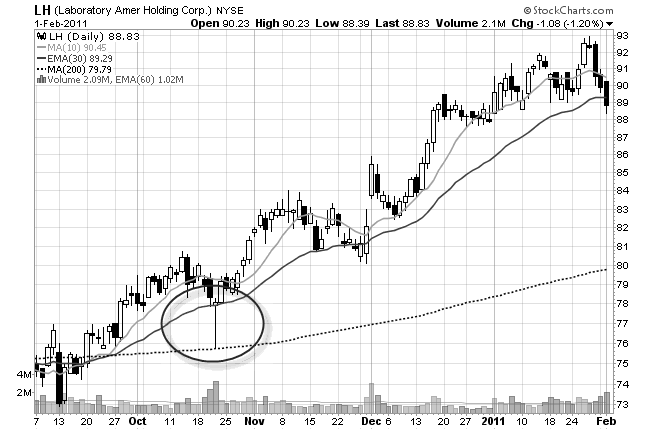 Give more weight to setups where the stock gaps away from the previous candle to end the day in hammer. Yes, you will have losing trades with this pattern. There is no pattern that will guarantee all winning trades! But with proper money, trade, and self management, you can do very well with this setup.